Deramaxx for dogs offers both risks and benefits to your pet, and your vet must weigh both of these factors before deciding to prescribe this medication. This drug is considered one of the top Rimadyl alternatives, and it is in a different class of NSAIDs because the medication blocks the Cox 2 enzyme instead of the Cox 1 enzyme. Some vets believe that this makes Deramaxx a safer choice, because the Cox 1 enzyme is used for many bodily functions but the Cox 2 enzyme only affects inflammation and pain. Deramaxx for dogs can control pain and inflammation from surgery and dental procedures very effectively, and the drug works well for treating osteoarthritis in dogs. As an anti inflammatory for dogs Deramaxx is not a steroid, and it is very easy for you to administer because the tablets have a beef flavor that dogs usually love. Many dog owners have stated that they have seen a remarkable improvement in pain and inflammation after their dog has started taking Deramaxx for dogs. Limpness, lameness, joint stiffness, and many other symptoms of pain or athritis can be minimized or even eliminated completely. 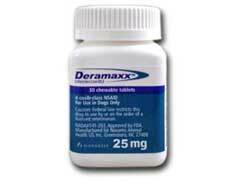 The once a day Deramaxx dosage is convenient and easy to remember. Deramaxx does have a number of risks associated with it as well though, and for some dogs the risks may outweigh the benefits. Some of the most serious Deramaxx side effects can be deadly if not noticed right away, because this drug can impact the way that your dog’s kidneys and liver function. The Deramaxx vs. Rimadyl controversy shows that Deramaxx is typical considered a safer alternative, but there are still risks involved. Deramaxx for dogs can cause an allergic reaction that may become life threatening, and should not be used if your dog has experienced allergies to any NSAID medications. Fresh water should always be available to your pet while taking this medicine and you should never give any other medicines to your pet, including over the counter treatments.